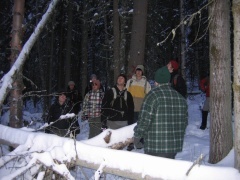 UNBC forestry students get an overview of tree hazard management within a stand next to the UNBC administration building (Photo: Dr. H. Massicotte). Earlier this month, a group of UNBC undergraduate forestry majors braved frigid temperatures to tour the sites of planned stand management treatments at UNBC’s Prince George campus. The treatments were developed by Mike Jull, ALRFS Manager, to mitigate fire and danger tree hazards on campus. Selective tree removals for the inner campus will take place at the end of February, when students will have the opportunity to observe the effects after treatments are completed. Surrounded by forest, including a greenbelt to the west, UNBC campus serves as an important location for hands-on learning in a variety of environmental and natural resource management labs such as soils, basic field skills, silviculture, vegetation assessments, and wildlife management.